Name means: "Circle of Friends"
The hip hop band from Stuttgart, also known as FK, raps their songs in German and Esperanto. With their first single "Leg dein Ohr auf die Schiene der Geschichte" in 1997, they proved that Germans could be amenable to embracing hip hop music that takes on political themes. Freundeskreis is known for promoting a spirit of international cooperation and respect for differences not only in their lyrics but also in their musical compositions. 1996/97 they went on tour, first as an opening band for Die fantastischen Vier, then played several festivals and open-air performances. It was their second single "ANNA (immer wenn es regnet)" that gained them widespread attention and increased interest in their concerts. The song made it to number 6 on the German charts. Two years later, their hit "Mit dir" followed into the Top Ten. The band gained the reputation of being an excellent live band, not least because they tour with a full live band rather than the typical hip hop instrumentation of just turntables and a microphone. Although the band's musical roots are in hip hop, their compositions display elements of other musical styles, including soul, funk, reggae, and jazz. In 2004, Herre found commercial success as a solo artist when his solo debut album went to number 1 on the German LP charts. 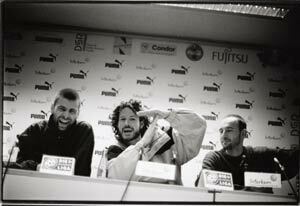  Freundeskreis was the first band to sign on to the then-new label of Die Fantastischen Vier, Four Music.  Herre is married to German soul singer Joy Denalane, whose videos he has directed. They have two sons.